The District Detroit is now a destination along a new public transit route that quickly links residents, workers, visitors, business travelers and sports fans along Woodward and other routes. SMART, also known as the Suburban Mobility Authority for Regional Transportation, launched FAST in late December offering passengers rapid, limited-stop service throughout the Detroit area, 7 days a week. A one-way ticket is $2 for adults, $1 for students ages 6-18, $0.50 for seniors 65+ and $0.50 for those with disabilities. Kids under 5 are free when accompanied by an adult. Transfers cost $0.25. 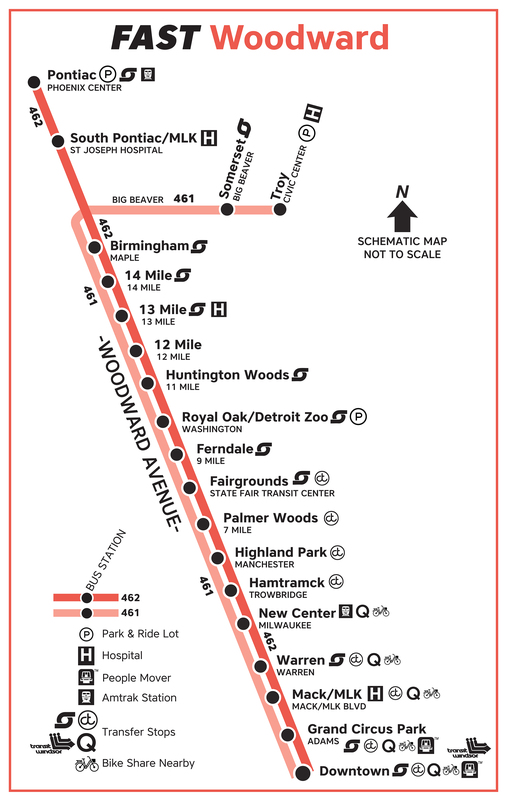 FAST Woodward runs from the Phoenix Center in Pontiac to downtown Detroit, stopping at landmarks, shopping districts and transit hubs like the Detroit Zoo, downtown Ferndale, the State Fair Transit Center near 8 Mile and New Center. The FAST Woodward bus also passes Comerica Park, Ford Field, Little Caesars Arena, the Fox Theatre and other entertainment venues before reaching Grand Circus Park at Adams. The service, which stands for “Frequent. Affordable. Safe. Transit” boasts free Wi-Fi and routes centered around downtown Detroit and bustling corridors on Woodward, Gratiot and Michigan avenues. The service replaces the RefleX bus service operated by the Region Transit Authority of Southeast Michigan. Other public transit options in and around The District Detroit include the QLine (formerly, the M-1 Rail), the SMART Bus, the City of Detroit’s DDOT bus service and the People Mover. Find FAST routes and schedules at www.ridesmartfast.org. For live customer service Monday-Saturday, call 866-962-5515.